The report " Trace Minerals (Chelated) in Feed Market by Type (Zinc, Iron, Manganese, Cobalt, Chromium, Copper), Livestock (Ruminants, Swine, Poultry, Aquaculture), Form (Dry, Liquid), Chelate Type, and Region - Global Forecast to 2022 , chelated in feed, in terms of value is estimated at USD 431.2 Million in 2017 and is projected to reach USD 570.8 Million by 2022, at a CAGR of 5.8% from 2017. The objectives of the chelated feed trace minerals based on type, livestock, chelate type, form, and key regions. Standardization of meat products owing to increased outbreaks. In addition, growth in livestock production followed by driving the global chelated feed trace minerals feed market. The zinc segment is projected to grow at the highest rate during the forecast period. " In 2016, on the basis of type, the zinc segment accounted for the largest share of the feed minerals in terms of value and volume. Zinc is widely used because of its high applicability for different feed products. Zinc, when added to feed, increases growth in the early nursery phase, improves the poor health status of the animals, and also helps alleviate stress challenges in the overall growth of animals. 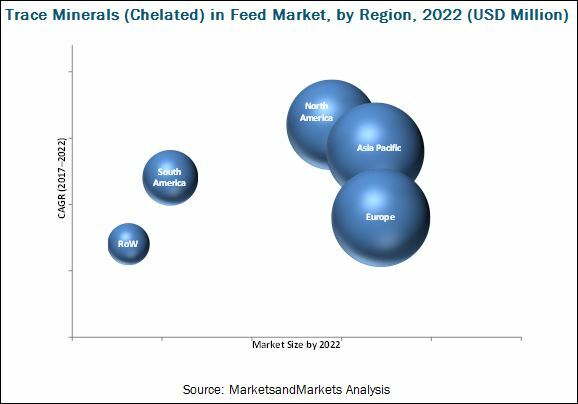 In 2016, the poultry segment accounted for the largest share of the chelated feed trace minerals market in terms of value and is projected to grow the highest CAGR from 2017 to 2022. formulation. These minerals help reduce the overall cost of feed. North America is one of the largest producers of livestock and animal-based products in the world, with the US being a major producer. Growing production, as well as consumption and livestock-based products in this region, have enabled livestock producers to utilize feeds with chelated trace minerals, as they are highly effective in promoting growth of animals and improving the fertility rate. The USA has the largest market for chelated feed trace minerals in North America in 2016. Cargill, ADM, DSM, BASF, and Nutreco in North America. This report studies marketing and development strategies, such as Cargill (US), ADM (US), BASF (Germany), DSM (Netherlands), Nutreco (Netherlands), DLG Group (Denmark), InVivo (France), Bluestar Adisseo (China ), Alltech (US), Phibro (US), Kemin (US), Zinpro (US), and Novus (US).